Today we rolled into Alice Springs, just on 3,000 km from home, more than half of it on unsealed roads, and well beyond the reach of modern technology. For that reason, and because, well to be frank, there are more exciting things to do than sit in front of a computer, I could be a few thousand kilometres behind with the picture. 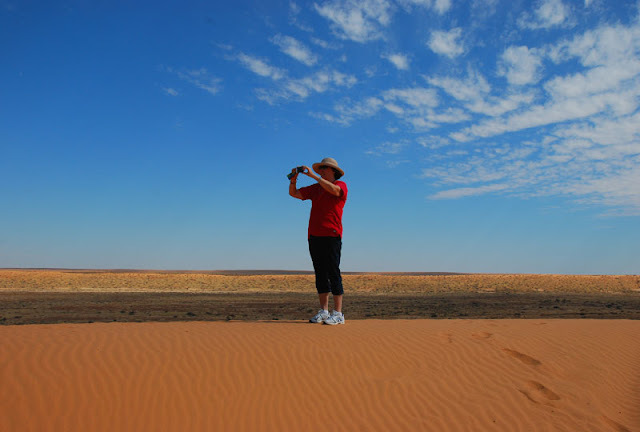 So here's my favourite photographer doing her thing on top of Big Red, the most fearsome sand dune in the Simpson Desert. I would love to see some of the pictures in that Mum took there- there is no rule against posting more than one pic! Today, Julian and I are going to a theme park with my workmates. I'm not so sure about the scary rides, but I will do my best! We're up to a top of 13 degrees today, should I take my jacket or just a jumper?